Calendula (Calendula officinalis) - Provides a sense of peaceful safety by creating heart-centered strong energetic boundaries electrically grounded into the Earth. Filters psychic intrusion. I AM strong physic boundaries, grounded through my heart into the Earth. Calendula is native to southern Europe and grows easily from seed in most temperate climates. It is primarily used as a salve to treat minor skin problems like cuts, scrapes, wounds, inflammation, minor burns, acne, rashes, diaper rash and athlete's foot. 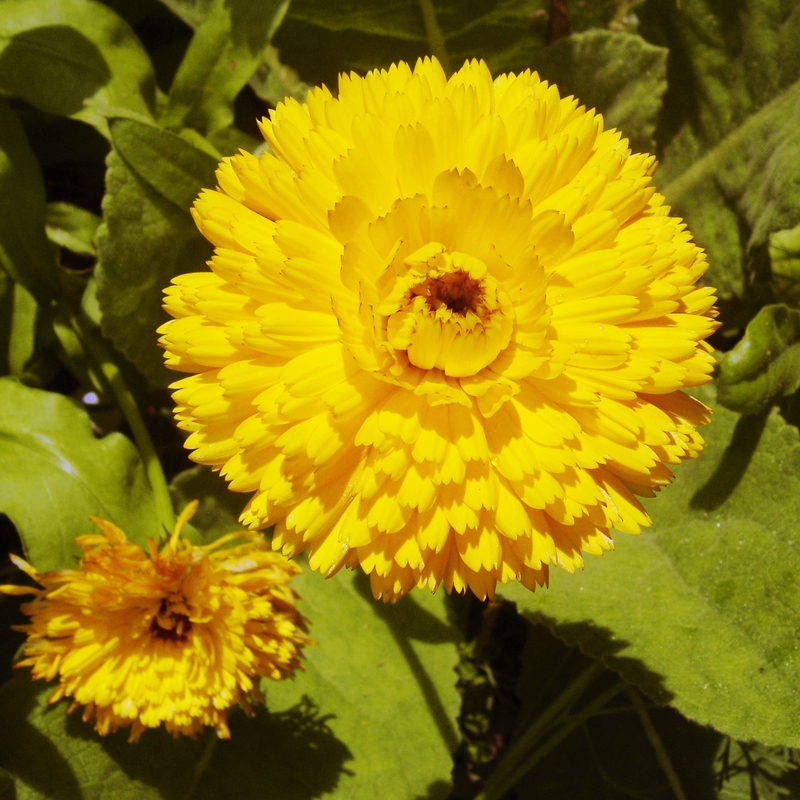 Calendula can be taken as a tea or tincture to detoxify the liver and gallbladder. This aids digestion and helps to clear the underlying cause of some skin conditions. Use Calendula Flower Essence when you don't feel safe, and don't know why, or when you sense “holes” in your energetic “skin”. If you feel that your energy fields are unstable or need grounding - literally as in grounding electricity – Calendula Essence will be helpful. Calendula Flower Essence electromagnetically strengthens and aligns the boundary between the astral plane and your subtle bodies to create protection from psychic intrusions. It connects your heart with the torus of subtle energy around your body facilitating heart-centered connection with the Earth. Calendula Flower Essence also provides energetic and electrical grounding. Together, all of this engenders a sense of peaceful safety. This essence was made by the “no-pick” method of working directly with the plant spirit. Crystals of amber, amazonite, citrine, copper, drusy quartz, icosahedron cut quartz, prasiolite, rutilated quartz, smokey quartz, and white and red stilbite were placed among the plants with the storage (mother) bottles during this process. The sun acts as a transformer to step down spiritual energies from higher dimensions. While the essence was being made, Amber acted as a lens to receive and focus sunlight for this purpose. Amber aligns the subtle bodies with the physical bodies, transmutes negative energy into positive energy, and emits a sunny and soothing energy that calms and enlivens the disposition. Amazonite blocks geopathic stress, absorbs microwaves and cell phone emanations, and protects against electromagnetic pollution. Citrine connects mind and will to become aware of issues relating to power and boundaries. Copper is a strong conductor of energy and electricity and grounds you into the Earth. Drusy Quartz crystals help to energize and stabilize your subtle bodies. Icosahedron cut quartz has 20 (5X4) equilateral sides. It is a bridge between the 5th Dimension - the entry into the unified Spiritual realms - and the 4 cardinal directions (N, S, E, W) on Earth. Prasiolite assists the grounding of high-frequency energy through the heart, facilitating connection between your Higher Self and the Earth. Rutilated Quartz works at the etheric blueprint level of your energy fields to heal blockages, tears or obstructions, and grounds Light energy at the cellular level. Smokey Quartz is one of the most powerful grounding stones because it assists you to complete the energy circuits between your physical body and the Earth. It can help you feel more engaged in the world and more capable of creating your own reality. White and red stilbite has a healing effect on the mind and energy fields, and a calming influence that brings inner peace. The actions of the crystals inform the way this flower essence seats into the body/mind. While the Calendula Flower Essence was being made, spirit song coming through Diana’s voice was infused into the essence.